Family Guy meets Star Wars! This superior-quality, limited edition lithograph on paper is one of only 1,000 hand-numbered pieces from Acme Archives. It memorializes that historic and hilarious "Blue Harvest" episode of Family Guy where Peter educates and intimately involves his family in the story of Star Wars. The image in this colorful, collectible work of art measures 19-inches tall x 13-inches wide. It comes in backer board and bag, and includes a certificate of authenticity. Fine enough to hang on your wall, it's also funny enough to keep you and your guests entertained for years to come! When the power goes out in the Griffin home, Peter decides to educate his family and pass along the greatest story ever told... Star Wars! After Princess Leia (Lois) comes under siege by Darth Vader (Stewie) and his evil Storm Troopers, C-3PO (Quagmire) and R2-D2 (Cleveland) escape to find the only person who can help the Rebel Alliance. On their quest through the desert planet of Tatooine, C-3PO and R2-D2 find extra help in Obi-Wan Kenobi (Creepy Guy), Luke Skywalker (Chris), and Chewbacca (Brian). 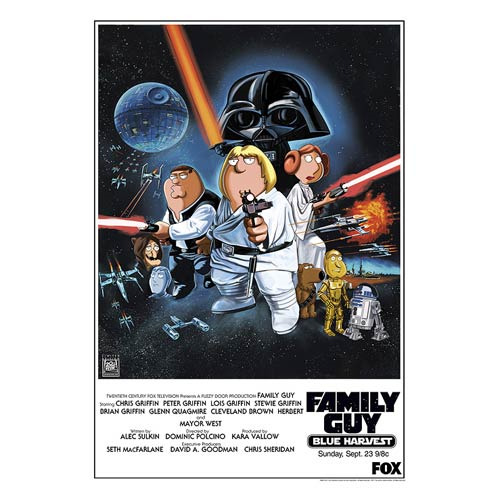 They head back to battle the Death Star in an epic intergalactic fight to the death in the "Blue Harvest: Parts 1 and 2" episode of Family Guy.